Ireland has the third-highest rate of deaths from overdose in Europe. 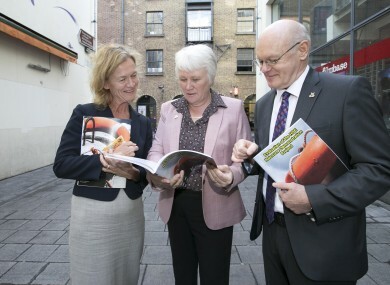 Dr Ann Eustace, Minister of State Catherine Byrne and HSE National Director Primary Care John Hennessy at today's launch of the report on Naxolone use. A NEW ANTIDOTE to heroin overdose has saved five lives as part of a trial HSE programme. Ireland has the third-highest rate of deaths from overdoses in Europe, while on average one person in Ireland dies every day from a drug overdose. Today, to mark International Overdose Awareness Day, Minister for State Catherine Byrne launched a new HSE report on Naloxone, which can be administered to reverse the effects of opiates like heroin, morphine and methadone. The pilot programme is due to be extended nationally within the next 18 months to two years, the chief pharmacist at the HSE’s addiction services told TheJournal.ie. “You’re talking a year and a half two two years for the rollout of the drug nationally,” Dr Denis O’Driscoll told TheJournal.ie at the launch of the report in Temple Bar today. It’s not prohibitively expensive, it’s €20 for a pack of five shots. It also has a good shelf live, of at least two years. The most recently published data on overdose mortality rates in Europe is estimated at 18.3 deaths per million population aged 15–64. The highest rates are reported in Estonia (113 per million), Sweden (93 per million) – and Ireland was third, at 71 fatal overdoses per million people. In most countries, naloxone is accessible only through hospitals and ambulance crews. Two years ago, the World Health Organisation recommended that countries expand access to social workers, family members and partners of people who use drugs. Last year, the HSE introduced Naloxone into local communities as part of a trial run which saw 600 trained in the administration of the drug. There’s a perception out there that if you don’t have a job, and you don’t go to work, and you end up being a drug addict it’s your own fault. “And there’s truth in that as well, but the opposite to that is, they don’t always have the opportunities in life that everyone else has, and that’s the truth. “I think there’s a huge stigma on drug use, in every community. And I suppose it comes from the history of how drug services were set up in communities. “People woke up and there were services around the corner, and they became very intimidated. I mean you’re bringing your children to school in the morning and there’s people shooting up in the lane. It’s not a very nice place to be, a nice thing to see.Communities have to be respected, but also I think people need to know that drug users are people and their lives must be respected too. Minister Byrne added that the Programme for Government commits to a health-led rather than a criminal justice approach to drug use, and that a new National Drugs Strategy will be formulated in the coming weeks. Tony Duffin, director of the Ana Liffey Drug Project, wants the medication rolled out countrywide and says much more can be done to help drug-users. “We have lobbied for supervised injection facilities for people who inject in public,” he said. Today, an external review of the Naloxone Demonstration Project found that six GPs (five in Dublin, one in Limerick) have wrote a combined 95 prescriptions of Naloxone two thirds in Dublin and a third in Limerick. Five males were administered the drug, preventing probably fatal overdoses. The drug was administered four times by frontline workers, and once ‘peer to peer’. They were all males aged between 31 and 50. For information on how to identify signs of an overdose, click here. Read: “The government needs its head examined” – should Ireland really throw €13 billion back in the EU’s face? Email “A new heroin overdose drug has saved five lives under a HSE pilot programme”. Feedback on “A new heroin overdose drug has saved five lives under a HSE pilot programme”.